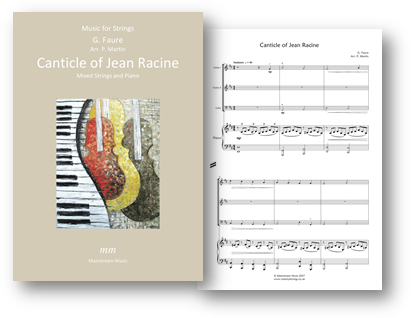 A setting for mixed strings and piano of Faure’s exquisite ‘Canticle of Jean Racine’. The PDF contains parts for violin III and viola ( in lieu of cello), and a part for viola, doubling that of the violin II part. This versatile arrangement can be played by a number of different combinations, from just two/three violins and piano to a full massed string group with piano. Click here to listen to a recording of the piece. Click on the image below to view/listen to the score on YouTube. Click here to visit the score's page.